Or, become a counselor yourself! Contact Nancy Day for more information. Webelos Den Leaders, Cubmasters, Scoutmasters, and Unit Commissioners all play a key role in Webelos to Scout Transition. Your goal should be to cross over 100% of your Webelos to a Boy Scout Troop. 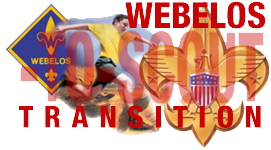 Click the logo for more information on the Pack's and Troop's responsibilities for Webelos to Scout transition.